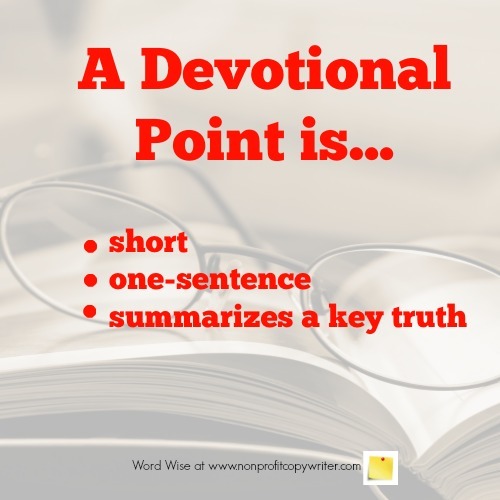 You can save time and aggravation in writing devotionals when you identify the devotional point first. And your writing will be more powerful, too. “The point” is a short sentence that summarizes the devotional’s key message, idea, principle, or truth. There have been times when the devotional point comes to me as a seed idea – even clearly – in a scripture, an illustration, or as a takeaway. I capture the idea, process it, and then write about it. But most of the time I have to sift through all the content I’ve gathered and work to find the point. It’s not an uncommon writing problem, but an important one to master. Practicality. A devotional clocks in at 200-250 words. There’s simply no room for more than one point. Impact. When you try to go in more than one direction in a devotional, your writing is cluttered, confused, and ineffective. When I say “write down your point,” what you need to do is write a short sentence that summarizes the spiritual truth you want to convey. Sift through the scripture, illustration, or takeaway that represents the seed of your idea. Don’t wait when you feel God’s call to forgive. You can forgive, even if the offender doesn’t ask for forgiveness. One response to Christ’s forgiveness is to forgive others. All valid. All different. You’ll be amazed to find out how much clarity you get when you put things in black and white. Take your time to write out your devotional point. It provides the foundation for your devotional. When I hit a snafu in writing down the point, I use these work-arounds. Even the shortest scriptures or simplest illustrations offer more than one nugget of biblical truth. As you write out your point, you may find you list several (like I did, above.) But you need not — and should not — make every one of them in the piece. Rather, your job as a devotional writer is to identify one point and drive it home. Workaround: List all your points and choose one. You can recognize this problem when you try to write out your point and the result is superficial, clichéd, preachy, or impersonal. The language may be trite and the answers too pat. The alleged “point” is simply too wide-ranging to zoom in on in a devotional and have significant impact. This happens to me when I don’t have clarity on a spiritual issue, when I’m too lazy to learn more, or when I’m afraid to dig deeper to identify the principle. Workaround: It is actually in these moments when devotional writing makes me grow the most because the solution is, of course, to fight to know the point. Uncomfortable? Yes. Worthwhile? You betcha. Perhaps you have a point but it isn’t biblical, as in “God helps him who helps himself.” You can recognize this problem when your point is difficult to connect to a scripture. Or you may have a good call to action – a challenge you want your reader to take – but it’s not grounded in scripture. 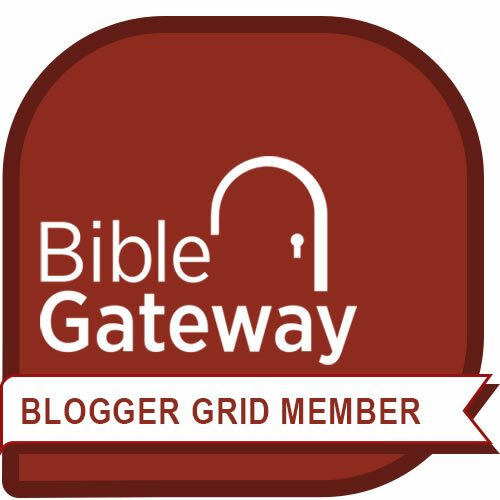 Workaround: Find scripture verses that speak to your point – preferably more than one. If you’re uncertain your point is a biblical truth, talk with a pastor or knowledgeable friend. Which is always a good idea, anyway.